There's a Card for That: Floral on Kraft | ft. Clearly Besotted "Thinking of You"
Floral on Kraft | ft. Clearly Besotted "Thinking of You"
Today I wanted to share another image that was done with coloured pencils on kraft cardstock. Orchids are my absolute favourite flower, though many of them have the same structure their colours vary greatly. It seems to be one of those flowers that can work with any palette in the home, and with a little care and patience, they make an excellent housewarming gift. To begin, I stamped the large orchid image from Clearly Besotted's "Thinking of You" stamp set using VersaMark ink, on 65lb Kraft cardstock from Recollections. While VersaMark is typically used for heat embossing (as you can see with the greeting, above) it can also be used to create a soft tone on tone effect. I chose to do this because it takes away the harsh lines of stamping in black, and is easier to colour over when using pencils. I then used my Faber-Castell Polychormos pencils to colour in the image. There is a light, medium and dark shade for both the purples and the turquoise, two shades for the green as well as the soft shadow behind the flowers. For the greeting I prepped the paper with my powder tool, and stamped the greeting using VersaMark ink again, and heat embossed it with clear embossing powder. I didn't want anything to take away from the vibrancy of the flowers. I then wrapped some purple and white baker's twine around the panel and tied a bow. I don't know if it is just me, but I cannot seem to tie a bow with the right side up. Whenever I have to tie a bow, like this one, I have to turn the whole piece upside down to get it to look right. To secure that, I just used a piece of clear tape on the back so that the wrapped twine wouldn't move. I then mounted this on a piece of turquoise paper that matched the medium shade of my pencils; and mounted the whole lot on a standard A2 sized card base. 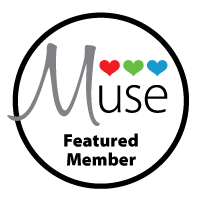 Thank you all for your votes, support and encouragement; with these, I was selected as a "featured member" through this post on the Muse Challenge. I cannot begin to tell you what this me. 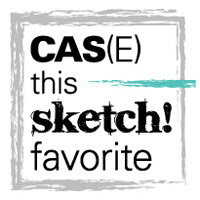 This card was also selected for Honorable Mention over on CAS(E) this Sketch! I'm so excited to receive this recognition! Beautifully coloured! Love how they look against the dark background! So glad you joined us at our Anything Goes week at Muse! Absolutely beautiful! Almost a 3-D effect with that shading and vibrancy! I think this reflects the colors of our photo challenge beautifully! I always love coloring on kraft too, it's a wonderful look. Thanks for joining us at TIME OUT! FABULOUS! Such a perfect reminder of what we can do with colored pencils! Lovely card Trina. Congratulations for Muse! The sentiment with clear embossing powder.. wow. That looks lovely on kraft! what a gorgeous card! Congrats!